Published: Oct. 31, 2014 at 02:15 p.m. Bigger, faster, stronger ... scarier? The talent level in college football continues to get better and while that's great news for NFL teams, it presents a bit of a challenge for opponents who have to face more imposing players. With that in mind, CFB 24/7's "14 for '14" series continues with a look at some of the nation's scariest athletes who will cause coaches (and players) to stay up at night. 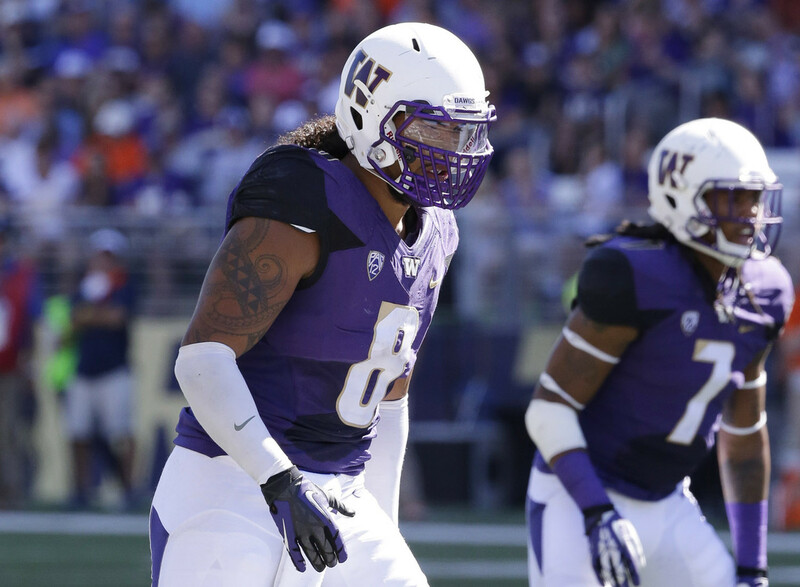 Buzz: Kikaha is an offense’s worst nightmare. He leads the country in tackles for loss and sacks as an edge rusher you don’t want coming at you. Throw in the flowing locks that sprout from his helmet, and there’s plenty of flair to Kikaha’s game too. Buzz: Shelton is one of the best defensive tackles in college football but has taken his game to the next level in 2014. When the mammoth tackle isn’t getting to the quarterback, he’s probably taking down a running back after tossing opposing offensive linemen aside like rag dolls. Buzz: If you want to scare a team by just having somebody walk off the bus, Peat might be the first guy you have in mind since he's 6-foot-7 and a shade under 315 pounds. He's a prototypical left tackle who is physically imposing and is part of the reason why Stanford has a strong running game no matter who is carrying the ball. The really tough part for defenders is that in addition to being a beast in the run game, Peat has the agility to stonewall any pass rusher. Buzz: Ask any Clemson opponent to name the player they had circled in the game plan, and they'll all respond with No. 3 on defense (Beasley). He's undersized at defensive end, but that doesn't make his lighting-fast first step or agility any less scary for opposing offensive tackles. He led the ACC in sacks last season and continues to terrorize quarterbacks in 2014. Buzz: It doesn’t matter what you throw at Cooper, he’ll find a way to beat the coverage and make something happen after the catch. He might be playing with a new quarterback in a new offensive system, but the Crimson Tide star is turning in one of the best seasons ever for a receiver, and he’s only scratching the surface of his talent. Buzz: Just ask an Alabama player how scary it is to play against Striker. He is one of the best blitzers in the country and should be even more dangerous as the Stoops brothers continue to put him in good spots on the field. A ferocious hitter, offenses will know where he's lining up before every snap. Buzz: Williams was an All-American last season despite playing with a torn labrum and being just "65-to-70 percent" healthy. Sadly for opponents, he’s at full strength in 2014 and might better his numbers from last year despite drawing a double-team on nearly every play. Buzz: If you search YouTube for Perryman's name, the title of the videos that show up often have "big hit" in them. That should say it all, but we should point out he's continued to bulk up and is still a tackling machine after the move inside to middle linebacker in 2014. Basically, he's a wrestler who happens to be good at football in many different areas. Buzz: While Jimbo Fisher might be a little scared every time Winston's name pops up in the headlines, he undoubtedly is reassured when his QB is between the lines. There are few better at the position. He can burn you when you bring pressure or calmly make a big play when you try to drop everybody. The only person who seems capable of stopping Winston is Winston himself. Buzz: As good as Mariota was last year, he might be even better this season for the Ducks. He leads the country in passing efficiency and might be the most dangerous runner in the sport with the way he can turn the corner and find the end zone. He might be the nicest player off the field, but he’s nothing but scary on it when you’re trying to contain him. Buzz: His numbers might have slipped a little last season thanks to a position change, but make no mistake, McKinney is one of the top linebackers in the nation's toughest conference. He can chase you down, hit you like a hammer or take the ball right out of your hands. Plus, when he puts on the eye black, he's all the more menacing. Buzz: The JUCO transfer lived in the backfield of opponents last season and is somebody many are touting as a future first-round draft pick. He can chase down any runner from behind or burst off the edge and get to the quarterback in devastating fashion. He might have missed some time early in 2014, but he’s bigger and better than ever. Buzz: T.J. Yeldon is the more complete back in the Alabama offense, but there's little doubt that Henry is way more physically imposing. With his size, Henry strikes fear into any defender who has to tackle him. Henry had a huge game in the Sugar Bowl, and if he keeps that up, he should be the next great Crimson Tide tailback. Buzz: The running back position might be devalued in the NFL draft, but it's still a big part of football and especially so in the SEC. Gurley has the power to run over folks, the speed to run away from others and can churn out yards with the best of them. Plus, he can catch the ball well as one of the true all-around threats at the position. Whether you're game planning against him or trying to tackle him, Gurley is a scary player to face.